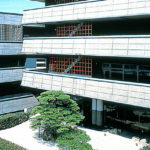 Matsuyama is the largest city on Shikoku and the capital of Ehime Prefecture in the west of the island. Matsuyama Castle perches atop a hill in the centre of the city and from its lofty heights there are wonderful views of the city below and even – on a clear day – of the Inland Sea in the distance. The city is also well known as the setting of Natsume Soseki’s popular novel, Botchan, which helped make the city famous throughout Japan. Today, this connection is commemorated by the Botchan Densha train which operates on the old streetcar tracks through the city. Although the train is electric, it is designed to look like an old steam locomotive. 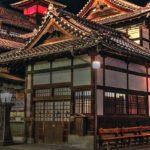 Dogo Onsen is also mentioned in the story and is one of Matsuyama’s most popular tourist attractions. One of Japan’s oldest hot spring resorts, Dogo Onsen is also thought to be the inspiration for the bath house in the Studio Ghibli movie Sprited Away.